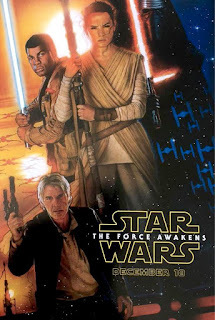 As we near the release of Star Wars: Episode VII: The Force Awakens we are getting tons of new tidbits, art, and photos. The newest addition is an amazing new poster by the incomperable Drew Struzan. What I think is an awesome new item is the reveal that John Boyega's character Finn is a Jedi! Very Badass! Returning cast include Mark Hamill, Carrie Fisher, Peter Mayhew, Kenny Baker, Anthony Daniels, and long-time grumpy man Harrison Ford. Along with them arrives a fresh batch including Daisy Ridley, John Boyega, Adam Driver, Oscar Isaac, Gwendoline Christie, Lupita Nyong'o, Domhnall Gleeson, Max von Sydow, and Hollywood's go-to motion captured specialist Andy Serkis. Star Wars: The Force Awakens hits theaters Dec 18th.